From time to time I am asked by other photographers -- both professional and amateur -- what my post-production workflow is like (that is, what do I do to my pictures from the time they’re taken in camera until the finished print is in my clients’ hands). I’ve had many conversations about this with various people over the years, and thought that some might find it helpful to see my step-by-step process. I also thought my clients might find it enlightening to know all the work that goes into their images from start to finish. I’m going to cover both my process as well as the software I use. Caveat: this is not “the only way to do things.” It’s just what works for me. I hope you enjoy. Step 1: Make great images, right from the start. This post focuses primarily on what happens to the images once they’re transferred from memory card to computer, but if while shooting you ever find yourself uttering the phrase “fix it in Photoshop,” you need to stop, take a step back, and dump a bucket of ice water on your head. Photoshop can make good images great. But it can’t make a bad image good. Step 2: Backup, backup, backup. Need I say more? What would happen if that hard drive were to fail? This happened to me once... years ago, there was one time when a hard drive died on me, and I had not yet backed up one or two smaller jobs. I spent close to $1000 getting the data recovered. My clients got all of their images, but it was a close call, and I learned my lesson. Since then, I always have multiple copes of my images and data, just in case something happens. In brief, what you see is my primary monitor (a NEC 3090) which is color-calibrated to make sure my prints match what I see on screen. 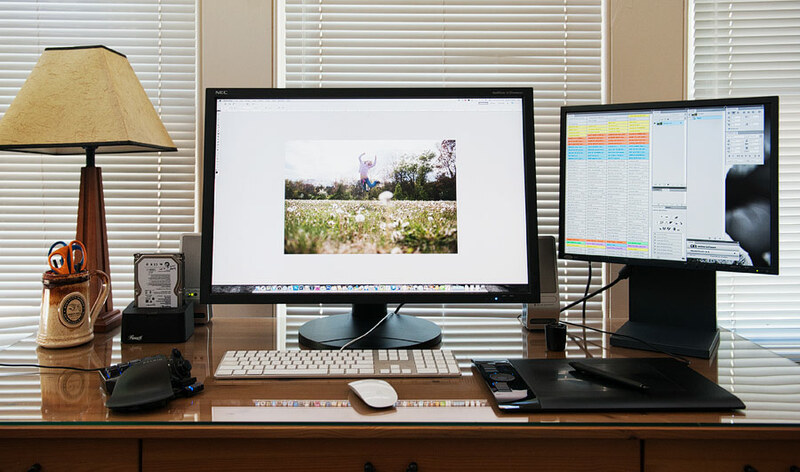 The secondary monitor allows me to have all of my tools in Photoshop and other programs off to the side, using the entire main monitor for the image. To the right of the keyboard is a Wacom Intuos4 tablet which is incredibly useful for retouching, and to the left is a left-handed gaming keypad which I use to control frequently-used shortcuts in Photoshop. Nerdery, I know. 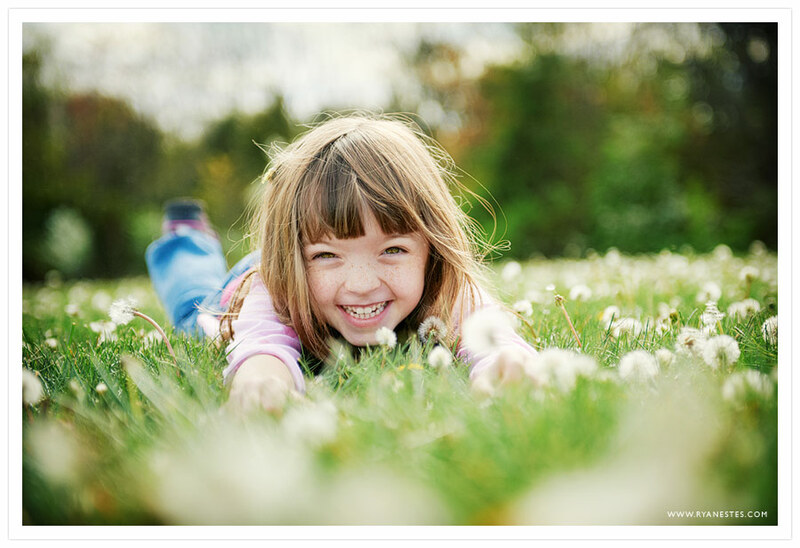 Step 3: Cull the images in Photo Mechanic. Step 4: Convert the raw files to JPEG. Here’s the point at which many people will probably start disagreeing with me. Eh, whatever. I shoot absolutely everything in raw, and before doing anything else with images shot in raw, you have to convert them into more user-friendly format. It’s also the point where I take care of rough image edits, correcting exposure, white balance, color balance, cropping, lens correction, etc. 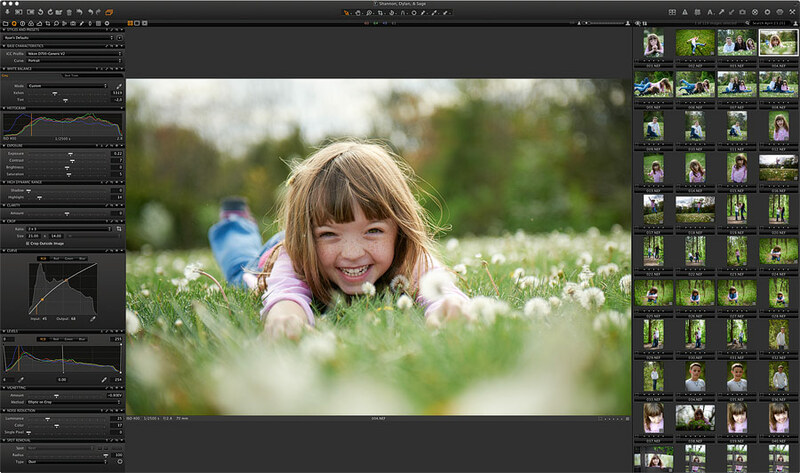 Again, many (if not most) portrait and wedding photographers use Lightroom for this. Lightroom’s a great program, I own it, and I use it sporadically for various jobs, such as weddings (even though I don’t shoot weddings very often anymore) or other jobs where I have hundreds of images to get through. For everything else, though, it’s Phase One’s Capture One. 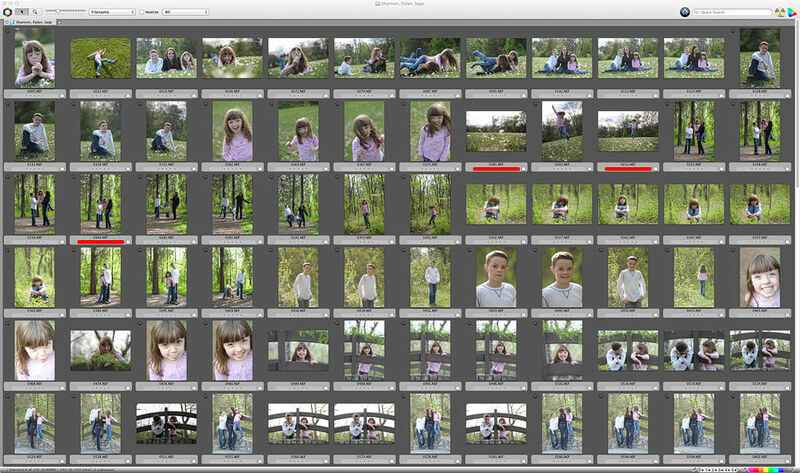 Believe me when I say this: Capture One is the finest piece of raw conversion software I’ve ever seen. Can it be frustrating? Sure. Learning curve? You bet. Highest quality results you’ve ever seen? Yes, yes, yes. I will never look back. In Capture One is where the image starts to look something like what I want it to. [Warning: Technical photo-nerd talk ahead.] Some people out there will also make arguments for using 16-bit TIF files instead of JPEGs. Hey, whatever works for you. Personally, I find it difficult to see the difference either on-screen or in print between a TIF and a JPEG saved at the highest quality. 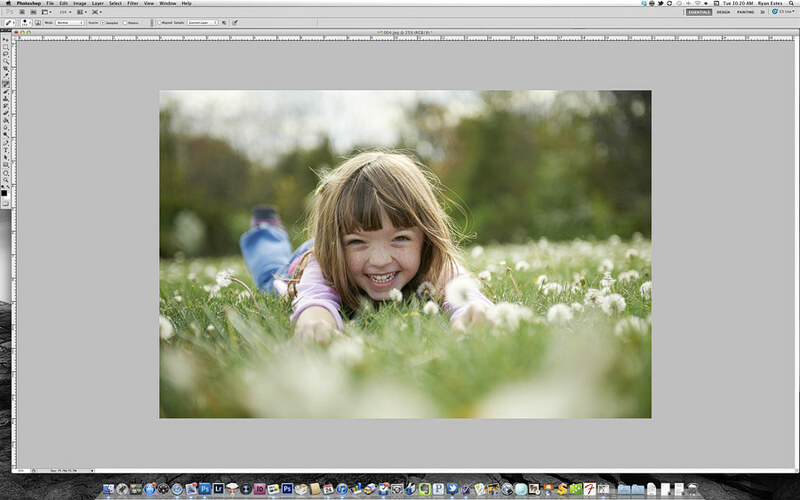 Step 5: Bring images into Photoshop for final edits and tweaks. Although more and more photographers are using Lightroom as their exclusive image editing application, I’ve never found it to be that great at local edits. Sure, I’ve seen pictures edited ONLY in Lightroom and thought, “Wow, they did a great job, and didn’t even use Photoshop.” But I’m picky, and firing up CS5 (or the recently announced CS6) definitely lets me edit on a more advanced and delicate level. For the most part, every image gets a slightly (and sometimes drastically) different treatment. Although there are jobs where I batch process hundreds of images through the same steps, for portraits I generally want to make sure that each image is getting the royal treatment. Because I’m not delivering anywhere near the number of images that I do for a wedding, this is possible. 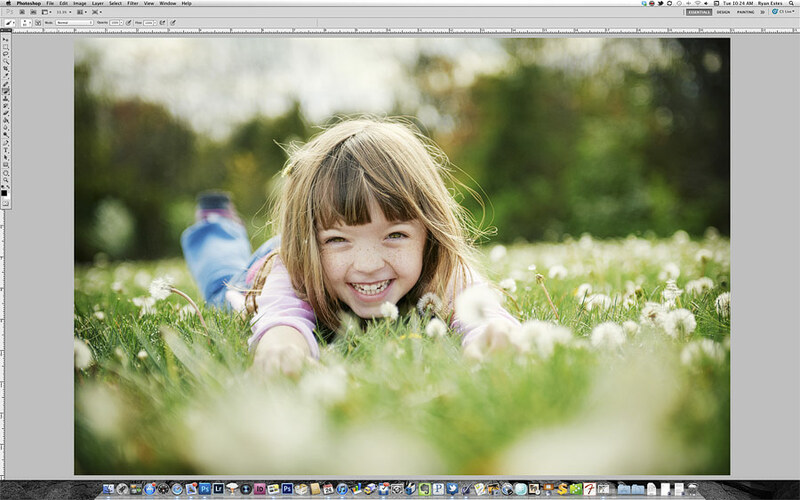 The latest versions of Photoshop contain sa-weet tools for removing unwanted elements from pictures. It’s still WAY easier to do this in person, before taking the picture, but sometimes you just can’t get that exit sign out of the picture, or there’s a piece of trash on the grass you didn’t notice earlier. In this picture, some stray dandelion spores looked like dust on the picture, so I removed them. She's also got some stray hairs, but they really fit her personality, and seemed appropriate to the running-around-the-field way I shot this image, so I left those in place. Are there things that just can’t be done in Photoshop? Yes, and sometimes I get requests where I either have to say “Sorry, impossible” or “That’s doable, but it will take a skilled retoucher several hours to do that, here’s how much it costs, are you sure you want to go that route?” But it’s easier to do now than it used to be. This is also the point at which I take care of skin retouching. Again... less is more, and the goal is to avoid making my clients look like a Barbie doll. But there are times when a child gets stitches right before a family shoot, or a groom wakes up on his wedding day with a zit on his forehead, or a newborn breaks out with a huge case of baby acne. These are generally solvable problems. Adjust curves/levels and do selective dodging and burning. While as much as possible we want to get the lighting just right in-camera, often I’ll need to slightly brighten or darken certain areas of an image. Usually I use the curves tool to do this, with a layer mask to apply it only to certain parts of the picture. There are also action sets out there that will automate the process for you. A word about Photoshop actions: Okay, quick sidebar. I’m a sucker for actions, and there truly are some fantastic sets out there for sale that are worth the money. I own sets from Totally Rad, Kevin Kubota, Jesh de Rox, and others. These companies have fantastic before/after sample images on their websites, and for the most part, they work as advertised. But when I look at some of my own work from early in my career, I can see I’d fallen into the trap of just running a few actions on some pictures and calling it “my style.” They can be useful tools, but they can be overused. The actions that I find most helpful today are ones that are functional, rather than artistic. One of the actions I use on almost every image I post on this blog is “A Better Web Sharpen” from Totally Rad. Some others can be used to punch up images, etc. But this is one area where less (a lot less) is more. My rant about actions notwithstanding, there ARE many times when I use them. Generally the rule of thumb is to enhance what already makes the image worthwhile. I almost never apply actions at 100% strength, and quite frequently I tweak what the action does to make it uniquely mine. For those who wonder, some of the ones I like a lot are Jesh de Rox’s ColorShift actions, and a small handful from Kevin Kubota, specifically his Artistic Tools V2. On this particular image, I used the “Rainforest” action at 12% opacity from Jesh’s ColorShift pack. Let me run through the steps quickly for an image from the same session that I decided to present in B/W. The image on the left is the picture straight out of the camera. 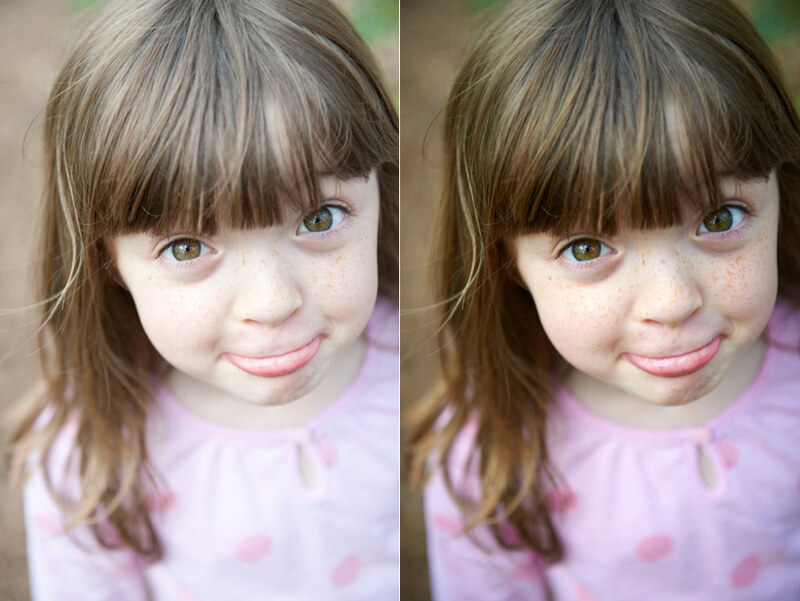 The image on the right is after applying general tweaks in Capture One. Here is what the Silver Efex Pro 2 screen looks like. Step 6: Save and backup again! I love sharing images on Facebook as much as the next person, but when I’m shooting, my ultimate goal is not to see the pictures on someone’s FB timeline. I want to create art for your home. Canvases to hang on your wall. Ever dig around in your parents’ attic and find a dusty box of old photographs? Not that I’m telling you to relegate your family portraits to the attic, mind you... but those moments of discovery are priceless! Now imagine your kids climbing into a crawlspace and finding... a box of by-then useless CDs? No thanks. A lot of care goes into making prints. Once the image looks as good as it can on screen, there’s yet another step before it can be sent to the lab. I resize the images in Photoshop to the required size at 300dpi, and sharpen them according to their size and the media on which they will be printed. A 5 x 7 printed on lustre paper will require a drastically different sharpening method than a 20 x 30 printed on fine art velvet paper. Nik once again to the rescue with their Sharpener Pro plugin. I haven’t found a better way to prepare an image for print. The last step is uploading the image to my lab. I use a stellar professional lab located near San Francisco, that has consistently delivered great quality and color. FedEx drops a box at my door a few days later, at which point I package them up in beautiful boxes, and deliver them to my clients. For the record, none of the companies I’ve mentioned here have asked or paid me to say any of this. There it is. From camera to print, this is what works for me. Feel free to agree or disagree with any or all of it (comments and questions are welcome), or to take it and use it. Just pursue your craft with passion.